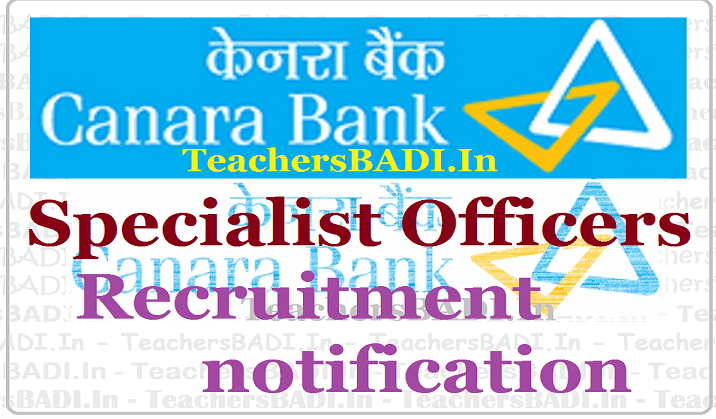 Canara Bank has given the Specialist Officers/SO posts 2017 recruitment notification and Canara Bank invites the online applications for the position of Specialist Officers in Junior Management Grade Scale - I and & Middle Management Grade Scale - II. Eligible candidates should apply Online mode through link given in our Bank’s website www.canarabank.com. No other means / mode of Application will be accepted. Please read this advertisement carefully and ensure your eligibility before paying fees / submitting on-line application. Posts details, Last date for applying online, Eligibility Criteria, How to Apply details given below. Canara Bank Specialist Officers, Canara Bank SOs Recruitment,Apply Online for Bank jobs..
Total No. of Posts: 101. B.E/ B.Tech Degree/ PG/ Chartered Accountant/ MBA (Finance)/ MMS (Finance)/ PG Diploma (Relevant discipline). April 5th is the last day to apply for Canara Bank "Recruitment of Specialist Officers in various disciplines (in JMGS-I and MMGS-II) and Special recruitment drive under Scheduled Tribe Category (in MMGS-II and MMGS-III)". Candidates, who are interested for it, but have not applied yet should apply today. Online application portal will be active till . For Manager Security post, candidates shall have to submit the physical application available in the website; the last date for which is 12 April 2017. The last date for printing application is 20 April 2017. Candidates must ensure that application fee is also paid along with the application. Candidates have to pay application fee of Rs. 600 (Rs. 100 for SC/ ST/ PWD category). The fee can be paid either by directly remitting the amount in any of the Canara Bank branches or else through NEFT in any other bank. Since it is the last day, candidates are suggested to opt for the second option for fee payment. However for Manager Security, candidates will be selected through shortlisting, group discussion and/ or interview. In order to prepare for it, candidates must be thoroughly aware of the online test and its pattern. The test will comprise of 150 questions and will carry a total of 200 marks. Candidates will be allowed 2 hours for the exam. Online test will be conducted by the Bank at at Ahmedabad, Bhopal, Bengaluru, Bhubaneswar, Coimbatore, Chennai, Chandigarh, Guwahati, Hyderabad, Jaipur, Kolkata, Kochi, Lucknow, Madurai, Mangalore, Mumbai, Nagpur, New Delhi, Patna, Pune, Raipur, Ranchi, Thiruvananthapuram, Vijayawada and Vishakhapatnam. Online test will carry 50% weightage during final rank list preparation. Application Fee: Rs.100/- for SC/ ST/ PWD category and Rs.600/- for all others categories. How to Apply: Candidates apply online (except for the post of Manager Security). Step I: Go to Canara Bank official website and click on the careers tab. Next, click on the Recruitment link. Step II: Click on the link for recruitment of Specialist Officers and Special Recruitment Drive for ST candidates. Step III: Click on the link which says Apply Online. Candidates who wish to apply for Manager Security post can download the application form and e-challan from the relevant links. Step IV: You will need to register first and create your user account. Then you can fill the application form, upload scanned copy of photograph and signature and pay application fee. For all other posts except Manager Security, the application fee can be paid only in the online mode.